1 of 3 Melt chocolate and shortening a medium-size microwave-safe bowl on high in microwave oven for 2 minutes, stirring halfway. Stir until smooth. 2 of 3 Using a small clean brush, spread about 2 teaspoons melted chocolate into bottom and up side of each cup. Chill cups until firm, about 10 minutes, reserving any extra chocolate. 1 of 1 Loosen a top edge and peel paper away (it will rip apart, but still come off cleanly). For silicone liners: Pop out of liners by gently pressing on bottom of cups, and pulling away side of liner from chocolate shell. 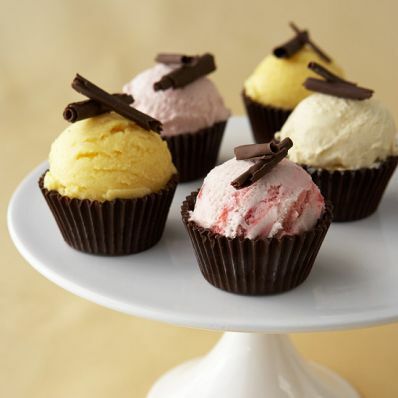 1 of 1 Scoop 1 generous scoop ice cream or sherbet into each chocolate cup (cups can be filled several hours ahead and frozen, covered). Immediately before serving, garnish with chocolate curls, citrus curls or fresh fruit, if desired. Per Serving: 48 mg chol., 40 mg sodium, 3 g pro., 39 g carb., 15 g Fat, total, 4 g fiber, 289 kcal cal.